Marine technology partners have developed a new long endurance, multi-vehicle, autonomous survey solution. 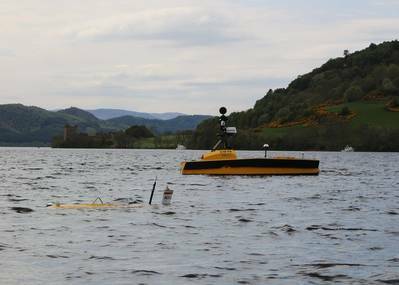 ASV Global (ASV), in partnership with Sonardyne International Ltd., the National Oceanography Centre (NOC) and SeeByte, have delivered a long endurance, multi-vehicle, autonomous survey solution after a two-week trial in Scotland’s Loch Ness. The tests were the culmination of the three-year ‘Autonomous Surface and Sub-surface Survey System’ collaborative project, part-funded by Innovate UK and Dstl, which set out to produce an integrated system to perform low cost, full water column marine surveys using multiple autonomous systems. During trials in and on the loch, Sonardyne’s ultra-short base line (USBL) acoustic positioning and AvTrak telemetry systems enabled ASV’s C-Worker 5 autonomous surface vehicle (ASV) to locate, track, command and control the NOC’s Autosub Long Range (ALR) autonomous underwater vehicle (AUV). Position and mission status updates were transmitted to shore via radio frequency (RF) communications. The need to collect more data from the marine environment often means that marine autonomous systems need to be at sea for longer. Pairing an AUV or unmanned underwater vehicle with an ASV enables positioning accuracy crucial for high-quality survey data to be optimized on missions lasting weeks, if not months, without the need for manned surface vessel support. The project partners say this technology creates dramatic cost savings in a wide range of maritime applications from pipeline survey to scientific coral exploration and deep water seabed mining. “This project has enabled ASV to extend its survey capability; pairing an AUV with our already proven survey platform, the C-Worker 5, has opened up new opportunities for our technology. We have been able to leverage the experience gained from this project into commercial applications, such as our recent delivery of eight ASVs to Ocean Infinity for AUV tracking,” said James Cowles, Commercial Technical Sales Manager. “We’ve shown that our technology can enable an AUV to operate autonomously with an ASV and offload its Solstice side-scan survey data using our BlueComm high-speed optical modem,” said Geraint West, Global Business Manager, Oceanographic, Sonardyne. “Proving acoustic enabled multi-vehicle tracking, command and control, with high-speed through-water data transfer also lays the ground work for long-range, over-the-horizon autonomous underwater vehicle survey operations,” he added. “Under this project, we have demonstrated a novel autonomous behavior running under the Neptune Autonomy engine able to optimize search, localization and tracking of multiple vehicles based on understanding of the overall mission tasks and the prediction of other vehicle positions. This behavior enables safe unattended comms relay tasking and efficient data transfers for long-range over-the-horizon maritime operations,” said Pedro Patron, Engineering Manager at SeeByte.